Slash the time you spend doing household chores with the Xiaomi Mijia S50 RoboRock Vacuum Cleaner (2nd Gen) - it’s as easy as pushing a button. We’ve got a question for you - what do you do on Sunday mornings? If your answer is “Laundry & Cleaning Up”, you are in for a treat with the Roborock. Spills Happen. Dust creeps in, pet fur gets in the way, and let’s face it, crumbs are the enemy. 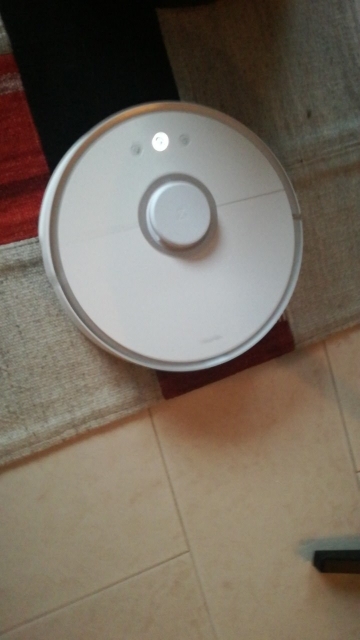 But no stress, the Roborock is a Cleaning Assistant that’s here to take care of these problems for you. Brought to you by Xiaomi - one of the largest electronics manufacturers in the world, the Roborock is a mighty upgrade to your good old fashioned Vacuum Cleaner. Featuring a 2-in-1 sweeping & mopping function, impressive suction power that lifts even cereal and grains off the floor, improved mobile app experience, The Xiaomi Roborock S50 is a definite upscale from its predecessor, we’re bringing to you a whole new world of convenience. So smart it runs on 4 processors? Double electronic compass identifies virtual walls accurately to prevent it from bumping into furniture while on its job. “My best buy of 2018 so far! I turn it on before going to work and when I am back - voila! The floor is clean. What a time saver!” ~ Dmitry B. Boasts of 2000Pa suction power - strong enough to handle everyday spills and food particles on the floor. Can handle both floors & carpets with the same ease - the Roborock automatically identifies carpets and adjusts the suction power accordingly. With a robust multi-brush tornado cleaning system that includes a floating brush to fit the ground closely, coordinated with the side brushes and roll brushes, this vacuum cleans up your floor better than you yourself would. Worried about the robot bumping into your furniture? The in-built area scanner scans the room with high precision, and the multi-sensor system prevents collisions and damage to your furniture and walls. With a ground clearance of 2 cms, the roborock comfortably passes through doorsteps and over your carpets too! Low noise levels due to its closed sound-proof cotton and porous air sieve, ensure it works with minimum sound & distraction. Syncs seamlessly with the Mijia app - allowing you to check cleaning status, battery level in real time, guide & control the robot remotely, and effortlessly set automatic cleaning schedules. We use it here at our office as well and 30 days in, it’s still amusing to watch it go about doing its job. The novelty doesn’t wear off! As of Q2 2018, Xiaomi is now the 4th largest smartphone manufacturer in the world and has won various awards and accolades for their innovation. As a brand, Xiaomi stresses heavily on the importance of selling a lifestyle, and the key to that lifestyle is MIUI, their software layer that ties all of these things together. They have ventured into the home automation & smart home electronics fields. The Roborock along with other products are making waves, and they are well on their way to bringing the “Internet of Things” into your home. Do more with your day. Or not. We’re not judging. Get The Xiaomi Mijia RoboRock S50 and kick back while it takes care of your daily cleaning up. The OzStore is committed to bringing you products that promise to make your life convenient. We’ve scoured the world for the best gadgets, tools and all products - both small and big, that provide comfort, style and an ‘uber-cool’ factor. Doporučuji, myslím, že kvalita je dobrá. Doporučuji, myslím, že kvalita je dobrá. Vysává dobře, mop využívám také. Určitě záleží na materiálu podlahové plochy, my máme velkofotmátovou dlažbu v celém přízemí a funguje to perfektně. Received it reasonably fast. Only tracking info was not accurate. Product received, while tracking " ready for dispatch" But performance is above expectations. Works very well. Hele snelle levering vanuit Duitsland en pakket is netjes aangekomen. Hele snelle levering vanuit Duitsland en pakket is netjes aangekomen. Nu benieuwd naar de stofzuiger resultaten.